Universal � interviewing all voluntary departures provides a more complete understanding of employee turnover. Standardized � using a core set of consistent questions ensures comparability throughout the organization and across time. Comprehensive � including feedback on the work environment in addition to reasons for leaving increases usefulness in determining strategies to reduce turnover. Independent � minimizing the discomfort in revealing the true reasons for leaving improves the reliability of the results. Available � encouraging centralized internal access to the findings increases the likelihood of taking action. Monitored � setting targets for reduction in turnover through planned strategies helps to ensure that the investment made in exit surveys is put to its maximum use. And, most importanly, using the results to design and implement strategies to increase retention and reduce turnover. As an alternative, there are a variety of third party survey tools available that can be used to interview departing employees in a more effective and efficient manner than the internal in-person interview. Given the proliferation of corporate Intranets, a Web-based method of data collection can be particularly useful in meeting this need. We'll list some of the most important principles for the design and deployment of exit surveys after this comprehensive review of the most recent thinking and analysis of employee turnover. There is substantial academic and business literature demonstrating the importance of employee satisfaction and engagement in building loyalty to an organization and, by extension, reducing employee turnover. 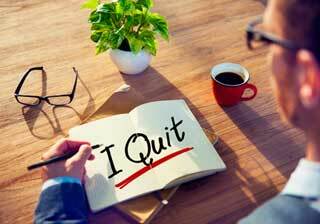 In this case, "turnover" is defined as an employee�s voluntary decision to leave an organization. In other words, the employee is choosing to leave following some sort of decision process during which they weighed the implications of both staying and going. Voluntary employee turnover is expensive, especially when both the tangible and intangible costs of turnover are taken into account. In fact, some estimates of the costs of turnover range from 50% - 200% of an employee's annual salary. Replacing employees who did not have to leave can be a costly enterprise. Excessive employee turnover is often cited as a critical barrier to high quality customer service at a time when the level of service provided is often the only factor distinguishing competitors from each other. Turnover reduces the productivity of an entire work unit/team, particularly as a result of uncompensated extra workloads, the stress and tension caused by turnover and, as a result, a decline in corporate morale. Training costs to bring the new recruit "up to speed"
Indirect turnover costs include the harder-to-measure variables such as the loss in organizational knowledge and skills, reduced corporate growth through lower productivity and the negative impact on organizational commitment that frequent turnover can have among the employees who stay at the organization. Although they may be difficult to calculate accurately, these indirect costs can often be greater than the direct costs of turnover. In fact, this model of turnover is based on the premise that active consideration to leave a job is necessitated by low levels of both job satisfaction and commitment to the organization and this model assumes that turnover decisions follow a rational and fairly deliberate, pre-determined path. However, in recent years, this simple model has been shown to be less effective at predicting turnover since there is not necessarily an orderly progression from dissatisfaction with a job to a search for alternative employment. In fact, we find in our employee survey work that the proportion of "Dissatisfied Compromiers," who are not satisfied but have no plans to leave, is usually much higher than that of "Change Seekers," who are not planning on staying. This finding corroborates the conclusion that dissatisfaction with a job does not invariably lead to turnover. There has also been increased recognition that many other factors can influence an employee�s decision to leave. Furthermore, the extent and availability of perceived alternatives for employment have not been shown to be a good predictor of turnover and the traditional turnover model overemphasizes the role of pay as a motivator to leave at the expense of other intrinsic sources of job satisfaction. As a substitute for the traditional model of turnover, the �unfolding� model of employee turnover has identified five main �paths� as the most comprehensive means of summarizing why employees leave their jobs. This model was first proposed by Thomas W. Lee and Terence R. Mitchell in 1994. (7) For three of these paths, a critical event or disruption (�shock�) in the employee's routine is sufficiently strong that it may lead to the decision to leave, even including abrupt decisions to go without considering alternative solutions and without the employee experiencing a slow withdrawal of commitment to the organization. In other words, this model does not assume that there is a linear and continuous relationship between the factors contributing to the decision and the turnover decision itself � rather, the �unfolding� model is more representative of the �threshold� nature of the decision to leave a job. Becoming pregnant, being admitted to college, needing to take care of a child or elderly relative, being relocated to another city because of your spouse�s job � these are the types of changes that generally do not prompt employees to reassess their attachment to the organization but can lead directly to a decision to leave, often because the employee's decision is as a result of factors outside of the organization's control. In our exit surveys, we refer to these departures as "non-preventable" turnover. Getting a new supervisor, being passed over for a promotion, getting demoted, being asked to relocate to another city because of your job � these are the types of changes that can cause employees to re-evaluate their commitment to the organization and then decide to leave, whether deciding quickly or over a longer time period and whether or not they have an alternate job in place. Note that these employees were not necessarily dissatisfied with their jobs prior to the "shock," which means that their decision to leave could not have been predicted in advance. Because these employee departures are in direct reaction to work place events, we describe these exits as "preventable" turnover. In traditional internal face-to-face exit interviews, leaving due to �better pay� and/or for a �better job opportunity� are often the main reasons cited for leaving the organization. However, relying on the information gathered in this way can be misleading, since, in this type of interview situation, employees are often reluctant to identify the true causes for their decision to resign and tend to provide more �socially acceptable� or "convenient" reasons for leaving. If you think about it, an employee who is leaving because of problems with their supervisor is extremely unlikely to admit this when interviewed by that supervisor! This is not to suggest that pay has no influence over an employee�s decision to leave. Rather, this issue emphasizes the need to be sensitive to both �push� and �pull� factors that may have influenced the employee�s decision. In order to collect the most effective information from departing employees, employers need to recognizes the need to provide departing employees with a forum that makes them feel comfortable revealing the full range of factors that led to their resignation and encourages them to give an honest critique of the expectations, conditions and requirements of their jobs. With the use of an online or telephone exit survey system that effectively gathers the opinions and attitudes of departing employees in a non-confrontational atmosphere, a much wider range of operational, organizational and personal variables affecting the decision to leave are likely to be uncovered than with the traditional in-person interview conducted by internal personnel. It is this kind of information that is essential to not only highlighting the perceived deficiencies in the organization�s working environment but they then be put to use to plan effective retention strategies and actions. Based on this analysis of the reasons for leaving and in conjunction with the unfolding model of turnover, it should be recognized that, in many cases, the organization has at least some influence over the employee�s decision to voluntarily give up a job. 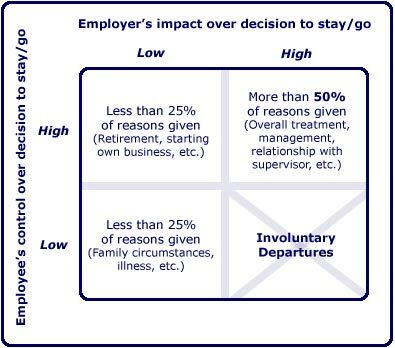 In fact, when all reasons for leaving are categorized in terms of (1) the employer�s impact on the decision to stay or go and (2) the employee�s own level of control over the decision, more than 50% of the reasons for leaving are within the control of both the employer and the employee. These reasons for leaving include both the longer-term concerns and problems that can lead to a gradual decrease in satisfaction as well as the more immediate work-oriented �shocks� that can prompt previously-satisfied employees to rethink their commitment to the organization and, ultimately, leave their jobs. From this analysis, it is clear that organizations should seriously consider what strategies and policies are in place to reduce turnover and retain valuable employees. Since a large proportion of turnover appears to be preventable, it is imperative for organizations to determine how best to intervene and thereby prevent at least some degree of turnover. Do not focus solely on the employee's reasons for leaving � although this is extremely important information, it is also critical to include broader measures about the employee�s attitudes and experiences so you will be able to identify issues and concerns that may not come up when asking specifically about reasons for leaving. Ask point blank whether the employee's decision to leave is directly related to their job, which is the best measure of "Preventable Turnover", or is external to their job situation, which will give you the proportion of "Non-Preventable Turnover" at your organization. This result alone can be invaluable in understanding how much of your voluntary turnover you can have an impact on. Once you've identified your "Preventable" vs. your "Non-Preventable" departures, ask questions to specifically uncover the distinct reasons they made that choice. Focus the preventable questions on factors relating only to their job experience and do not include either �better pay� or a �better job opportunity� as reasons for leaving because they are not relevant choices. Rather, ask a later question about whether they are moving to a new job. This will prevent you from getting "convenient" responses rather than their honest reasons for leaving. Ensure that there is more than one way for employees to express their reasons for leaving � including several open-ended questions for them to include their own comments � so as to get a full perspective on the decision to leave. This can be a great way to understand what "shocks" may have occurred that caused them to leave. In order to get beyond a focus on the decision itself, incorporate key attitudinal measures such as the employee�s satisfaction with the job itself, an assessment of the organization�s work culture and effectiveness of its various lines of communication, how well the employee�s job responsibilities were defined, perceived opportunities for advancement and the employee�s perspective on the amount of training, feedback and recognition received. These responses will give you a more complete picture of the working environment in which your employees are making the decision to leave. Recognize that, for maximum effect, any exit survey system needs to be implemented consistently and in such a way as to encourage employees to share their opinions as honestly and candidly as possible. Confirming that you will review all findings carefully and take action on them can also encourage participation, since many departing employees like knowing that their experience might help make things better for the colleagues they are leaving behind. Incorporate the ability to examine results not only on the basis of individual results but for the organization as a whole, as well as on the basis of the relevant diagnostics, such as region, department or manager. This approach will let you see "pockets" of best practices where turnover is lower and possible "hot spots" where turnover is higher than in the rest of your organization. Remember that make a distinction between idiosyncratic reasons for leaving, over which the organization has little control, and systemic reasons for leaving, over which the organization can exercise substantial control. For one client, we were able to identify that some employees were leaving due to negative behavior by certain managers but that attitudes toward managers as a whole were quite positive. This indicated a need to "weed out" or "retrain" the problematic managers but did not suggest the need for a wholesale re-training of all managers. Establish and maintain both the practice and the impression/perception of fair treatment of all employees, so as to help foster a positive, consistent and reassuring work environment. Ensure that senior management and immediate supervisors regularly and genuinely demonstrate their own sense of commitment to the organization. Emphasize the need for a close match between the personality/work style of prospective employees with the organization�s culture as well as providing prospective employees with realistic job previews � there is evidence to suggest that newcomers to an organization who leave within the first few years may have a different commitment propensity at the time they join the organization than do those employees who stay. (10) A more thorough assessment of an employees� past experience and reasons for leaving their last job may help identify employees who are more likely to feel a stronger sense of organizational commitment and loyalty in the long run. Properly introduce and incorporate new employees into the organization and carefully manage their expectations and initial experiences with the organization � in fact, a large financial services firm found that it could effectively reduce turnover among new hires by deliberately improving the process of socializing new employees into the corporate culture, particularly through the use of mentoring. Communicate realistic and attainable expectations of performance to all employees, so as to avoid the potential for �shock� and the development of dissatisfaction. Give positive and constructive feedback to all employees on a regular basis, using both formal job performance reviews and informal channels of communication with employees, and ensure that you implement a viable and meaningful reward and recognition program that works to motivate all employees. Offer clear-cut opportunities for job enhancement, advancement and career development. In summary, a well-orchestrated plan of exit surveys, in combination with other HR initiatives related to maximizing employee attitudes and behavior, has the potential to become a valuable tool to help reduce turnover and increase employee satisfaction and commitment. In turn, an effective reduction in turnover has clear economic and organizational benefits that can more than pay back the investment made in an exit survey system. Lee, Thomas W. & Mitchell, Terence R. (1994) An Alternative Approach: The Unfolding Model of Voluntary Employee Turnover. The Academy of Management Review, 19 (1); 51-89; Morrell, K,. Loan-Clarke, J. & Wilkinson, A. (2001). Unweaving Leaving: The Use of Models in the Management of Employee Turnover. Research Series Paper 2001: 1. Loughborough University. Mitchell, T. R., Holtom, B. C. & Lee, T. W. (ND). How to Keep Your Best Employees: The Development of an Effective Attachment Policy. Academy of Management Executive 15, (4): 96-109. Morrell, K. Loan-Clarke, J. & Wilkinson, A. (2001). Unweaving Leaving: The Use of Models in the Management of Employee Turnover. Research Series Paper 2001: 1 Loughborough University.